This exhibition outlines a great research and development period in Kristján Guðmundsson’s art, where he took on the perimeters of the drawing, and finally succeeded in finding it a three dimensional form, without ever deviating from the fundamentals of the method. Kristján Guðmundsson moved to the Netherlands in 1970 with his family, and lived there for the next nine years. The Dutch years are an important period of research and development in Kristján’s art. He studied the basics of drawing and the materials behind drawing, that is to say the paper, pen, and line. The drawing became a scientific process, one where a stopwatch and ruler was used when drawing the line. The work 6 x 7 Equal-Time Lines from 1974 is a good example of this process, with Kristján using blue office ink. Even though the exact same amount of time was spent on drawing each line, it is possible to detect variances according to whether the line was drawn straight or diagonally across the paper. The artist’s work methods are disciplined, clear, and should be understandable to all, with no room for idealism or obscure eccentricities. That is not to say that there is no leeway for a bit of cheek, as can be seen in the work Drawing 1972. The date of the work is in the title and it is also the key to reading it, as there are in it three areas, each covering 1972 square centimetres. The equation and the area correspond to the date, and therefore the work would be larger if it was repeated a year later, and would of course therefore also be smaller if the date was earlier – becoming nothing in the year 0. In the works Cause and Consequence from 1974-1976, the drawing is tackled on reverse terms. The correction tape forms a negative drawing on the paper. Material that is usually used for erasing and deleting mistakes has become the basis of the line drawing. There is a certain turning point in Kristján’s work after he moves back to Iceland in 1979. Precise and delicate drawings give way to three-dimensional works, and yet the idea of the periphery of the drawing is never far off. He is also still focused on time in the work Slower / Faster from 1984, but this time it is in 3D. 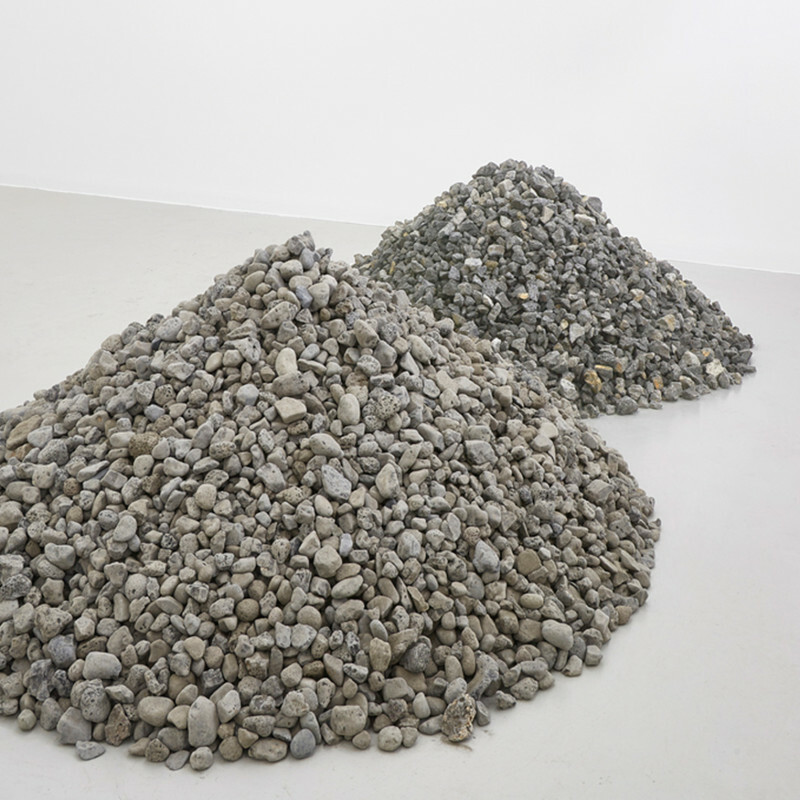 Here we see two piles of gravel that at first glance seem alike. A closer look reveals that one of the piles (slower) is made of beach pebbles, polished by the sea, while the other one is made of rock ground by machinery. The process behind this work has on one hand taken centuries and on the other just a moment, and the role of the artist is simply to take care of the staging. At Kristján’s 1987 exhibition in Ásmundarsalur the drawing was back as the principal medium, but this time it had obviously evolved into a more substantial and spatial form compared to his drawings from the seventies. In the relief Drawing from 1987, Kristján glued together sheets of cardboard and shaped it. The edge faces the viewer and the graphite has been nudged onto it so it’s not the pencil that has etched the forms on the paper but the other way around; the paper prints it’s form into the graphite. An outsider would define the work as a relief, and it may well be so even though the title says otherwise, but Kristján always alludes to tradition while testing its limits and boundaries. This process is evident in its purest form in Kristján’s drawings where the paper has entirely disappeared and all that left is the lead from the pencil or a piece of graphite, the same materials that are used in all pencils, and the space has taken on the role that used to belong to the paper. Kristján has rarely used materials meant for artists; he seeks out the general, industrial manufactured, the large and mass-produced. His works have redefined and challenged ideas about an unyielding sorting system of visual art and its subdivisions. Ólafur Gíslason and Sólveig Nikulásdóttir: Kristján Guðmundsson. Mál & menning, Reykjavik, 2001. Halldór Björn Runólfsson in Íslensk listasaga – frá síðari hluta 19. aldar til upphafs 21. aldar. Vol. IV., Popplist, raunsæi og hugmyndalist. National Gallery of Iceland, Reykjavik, 2011. Pgs. 171–181.